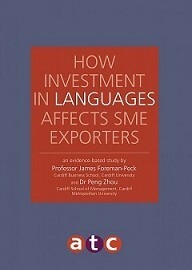 The new study by Professor Foreman-Peck and Dr Peng Zhou shows in stark detail the impact of in-house language capabilities on small and medium sized enterprises (SMEs) that export. As well as showing an increase in export to turnover ratio, the findings highlight that companies with in-house language capabilities are much more likely to appreciate the benefits of engaging external professional language services when exporting. Rather than one form of language provision replacing the other, SMEs with in-house language capabilities tend to adopt a twin-track approach to support their global business activities. The Association of Translation Companies was established in 1976 by a group of leading translation companies to ensure the quality assurance and accreditation of translation and interpreting companies in Britain. It is one of the world’s oldest organisations representing the interests of translation companies and helped form a Europe-wide association for the sector with representation in 23 countries. An award-winning, full service translation agency, Comtec has over 30 years’ experience in providing fast, accurate and high quality translations in more than 200 languages . We’re the trusted language translation partner for many companies who call on our knowledge of international business and expert translation services to help them expand into new markets overseas. If you’re a UK-based SME considering expanding your business abroad and would like some advice on translating and localising your business materials, please get in touch on info@comtectranslations.com or call us on + 44 (0) 1926 335 681. We’re here ready and waiting to help.